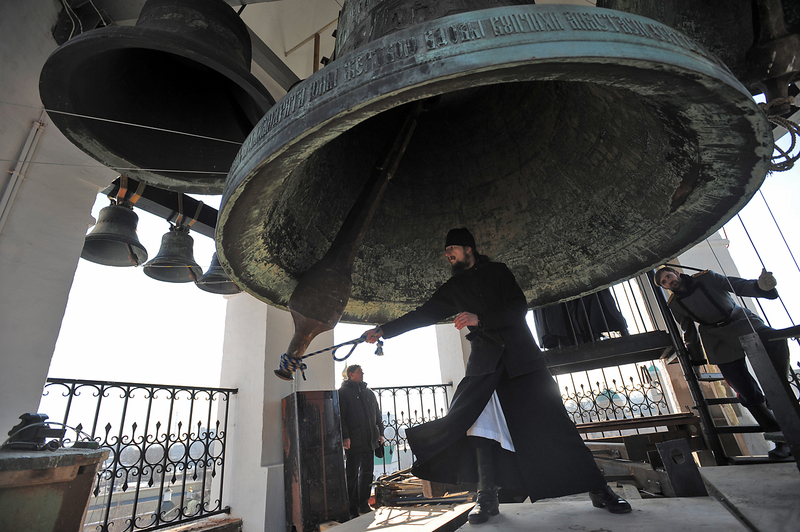 Orthodox priest rings the Bolshoi Bell, aka the Everyday Bell (the largest of the so-called Harvard Bells, the Big One) on top of the Church of St. Simeon Stylites at Moscow's Svyato-Danilov Monastery. Why do many Russians freeze in midstride when they hear bells? The special significance of the bell in Russia goes back centuries: Not only does it have a complex religious meaning, but it also has a distinctive sound like no other. In Andrei Rublev, legendary director Andrei Tarkovsky’s film about medieval Russia and one of its principal painters (ranked by the authoritative Sight & Sound magazine as one of the best films in the history of cinema), there is a scene in which the Russian nobles and the common folk freeze in tense expectation: Will the new, freshly cast bell ring or not? The same thing happens to Russians on the other side of the screen whenever they watch this scene, and this reaction is not limited merely to the movies: In a land that is returning to its deep religious roots, today many Russians still freeze in midstride upon hearing the toll of a bell. The amazing effect of the bell on a human being was known long before our era. According to Konstanin Mishurovsky, a historian and bell-ringer at the Moscow Kremlin and the Cathedral of Christ the Savior, the secret is simple: The bell combines two opposing qualities – the strike and the prolonged singing. This is just a Russian theory, however. Initially in Europe bells were used as signals: They announced the beginning or end of the workday, fires and epidemics and the beginning of services in temples. In ancient Russia, bells were primarily "aural icons," as American bell expert Edward Williams called them in his study The Bells of Russia, even though they maintained their function as signals. Bells invite people to church, accompany the service, the processions; they are sounded when a person is born or buried. The bell is the voice of God, the human prayer and an allegory of human life (for example, in the funeral toll the succession of the bells ringing symbolizes a person's life, the bells ringing simultaneously symbolize the death of his body and the festive peal symbolizes the resurrection of his soul). Being a part of the Orthodox service, the bell became the quintessence of what is known in Russian as sobornost (meaning “a common spirituality shared by the living”) – a concept that Lev Tolstoy and Fyodor Dostoevsky often wrote about, a concept that is instilled in the depths of the Russian character: It was impossible to live separately in the village – everything was done together. Sobornost manifests itself in each stage of the bell's life. It is created to call people to church, unite them during the service and sort of protect them temporarily from everything secular. Moreover, to create a bell it took dozens of specialists who worked together. They cast it together, they prayed together at the services, they attended funerals together. They even tolled the bells together. This is what music scholar Stepan Smolensky wrote in the 19th century: "…here is the first strike, unusually soft, not loud… It signals to all of Moscow. In five-six seconds all the 40 bells are pealing… They are ringing with an extraordinary power of sound. It is a power that absorbs everything… The sound is deafening, imperious, a real celebration! Such music can be heard only in Russia." Indeed the sound of the Russian bell toll is extremely different from any other. In Europe the bell sound is usually tuned, purified until reaching a clear tone, as with a musical instrument. In Russia the individuality of each bell has been preserved, as well as the complexity of the sound. Together with the specific requirements of the church canon, this ringing particularity resulted in a special Russian festive peal in the 18th-19th centuries. It is a combination of pulsating strikes of the big bell – called the “evangelist” – and a musical pattern of the small and middle bells. "Just imagine there is a procession and I am accompanying it with a festive peal," says Konstanin Mishurovsky. "How do I know how long it will last - will they walk quickly or slowly? But when the procession stops by the cathedral I must immediately stop the peal. That is why it must be beautiful at any given second, regardless of whether I ring the bell for 15 seconds or for half an hour. It is like a ribbon with an ornament. I can sew a short segment or a long one. I'll cut wherever is necessary." Yet there are no ideal collections of bells. Even the "purest" belfry in the ancient town of Rostov Veliky has one bell that does not fit in with the rest. But experienced bell-ringers are capable of producing a beautiful festive peal even in these conditions. It’s like a seasoning. And the peal is always different. The bell-ringer never repeats himself.